As we walked into the lobby to check-in to the hotel, Bill looked down at himself and realized he was wearing his gaudiest (and my favorite) Hawaiian shirt. “I look like a tourist,” he said. “We’re checking into a hotel,” I pointed out. I had no idea when I reserved the **last two** poolside rooms for two nights what a great idea that was. The pool is all the way in the back, and the Gulf of Mexico is just past it. Except for yesterday when we drove around the islands of Sanibel and Captiva because it was raining (and thundering and lightening), we have spent all of our time either at the pool or the beach, often between the two, and certainly making many potty trips at inconvenient intervals, because little children never all have to go at the same time. Twenty-five steps from my room, the sidewalk ends and sand begins. 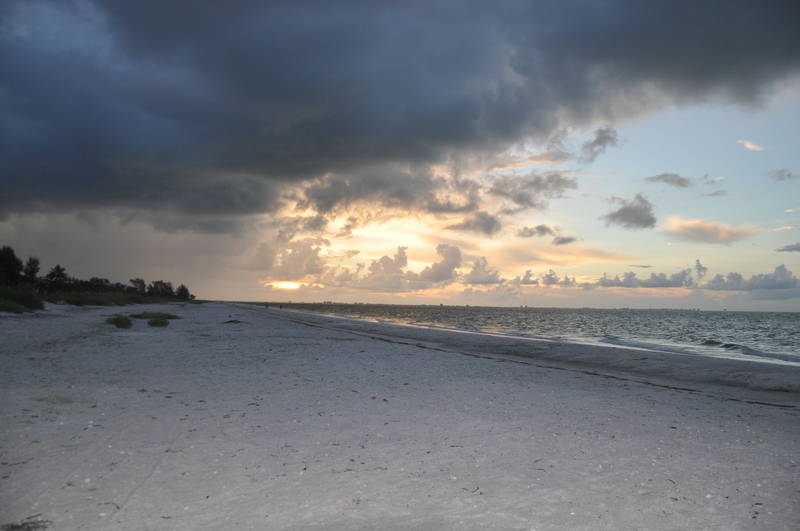 I am an early riser, and it has still been dark when I’ve ventured onto the beach before the dawn. Yesterday, I watched enormously tall thunderheads send long streaks of lightening into the water, not too far from where I stood. Today, there are some clouds, but there was just enough of a break to see the sunrise. Both days, the breeze has been perfect: just slightly cooling and gentle, but with enough force to make you notice. Because this place costs an arm and a leg each night, our budget tells us it’s time to go home. And the IHM Conference in Tampa, which I don’t want to miss, is tomorrow and Friday. Alas. I’m pretty sure I could live at the beach. Shelling. That’s my fashionista who saw a video online about scarf wearing. 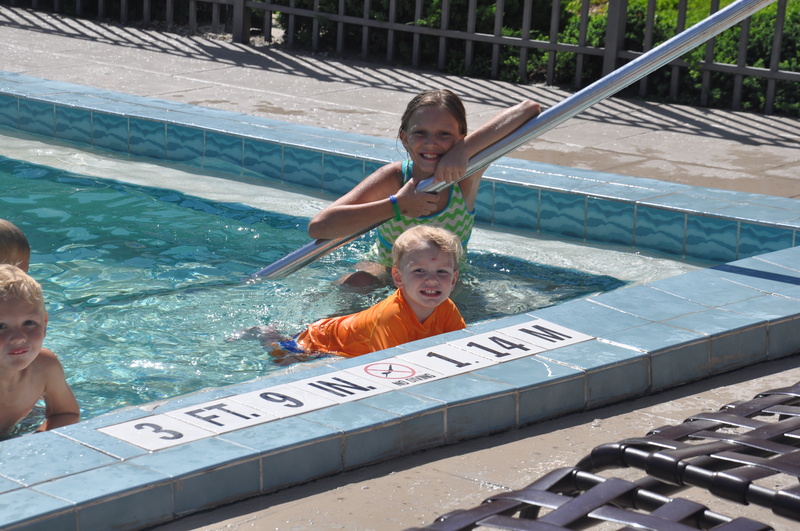 Heated pool feels good, even in Florida in July. 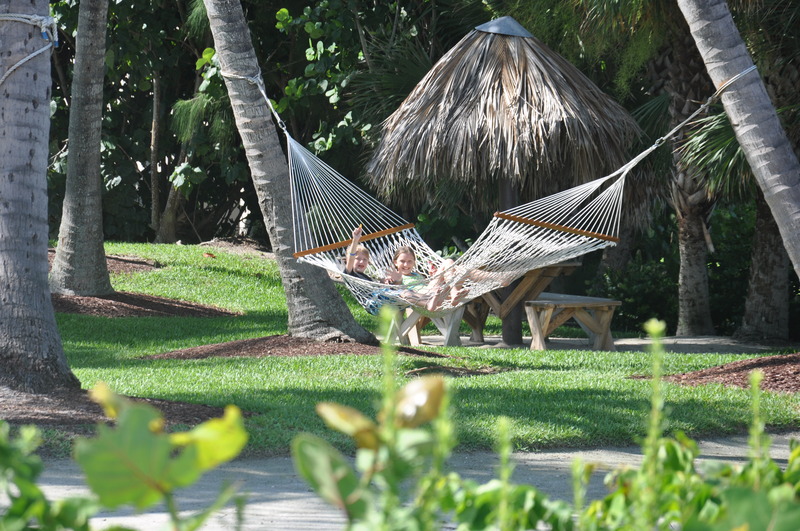 Hammock under coconut trees. Does it get any more “Florida-vacation stereotypical” that that? Are you in Ft. Myers? Looks like fun…it’s not cooking meals and doing laundry, so it counts as fun even with bathroom trips. 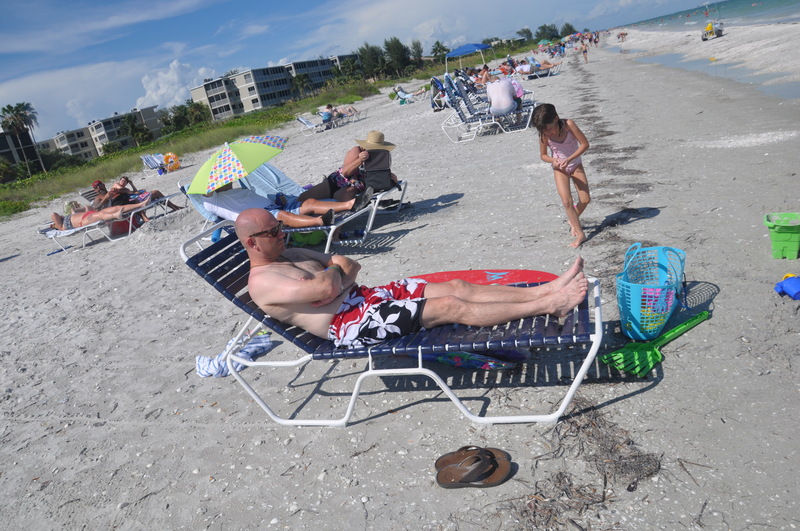 When we lived in Tampa (when I was a teen) we used to rent a cottage at Indian Rocks beach in Clearwater every year. I loved those weeks. I have no recollection of the cottage, or meals (which my mother cooked) or laundry (which my mother did) or anything other than a week on the sand and in the waves.